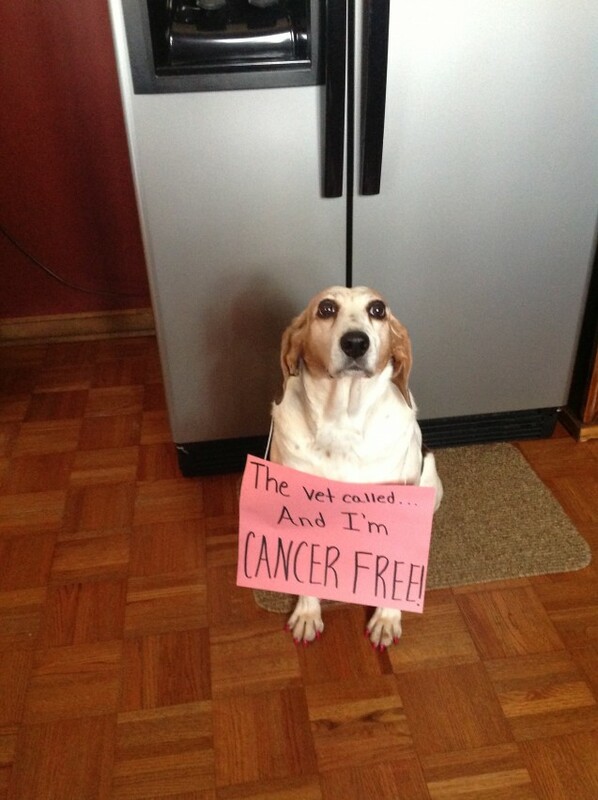 After a week of worrying, Molly’s doctor called to say she is cancer free! Editor’s note: This makes me so happy. Congrats Molly, I bet your family is very relieved that you’ll have many more dog shaming opportunities in your future. From my little fur family to yours, woofs, barks, and licks! Posted August 31st, 2013 . Congratulations Molly! May you life be long and full of walks to sniff the grass! WOOF AND WOOF! You go girl! Take long walks and live large! Hurrah, Molly. You are a cutie. And I’m crying. Oh Molly. YEAH! Now how about a big old grrrrrrrrrrrrrrrrrrriiiiiiiiiiiiiiiiiiiiiiiinnnnnnnnnnnnnn Molly! she looks like she’s wearing eye shadow. cute! Congrats Molly! I love your pawdicure. Yay Molly!!! That’s the best news!!! A round of special treat’s on me ! Yayyyyyyyyyy! Very happy for you Molly! Woof! Yeah Molly, Your good news made my day !!!!! YAYYY!!!!!! Many congratulations, licks and belly rubs from New Hampshire! WONDERFUL NEWS! ALL THE BEST MOLLY! From my Molly dog to this Molly puppy kisses in celebration! Puppy hugs to Molly and her family; I’m so happy for you all. Molly is a gorgeous doggie, who now has many dog years left to enjoy. Here are cheers for those years! Look at those eyes! This is wonderful news for every one of us that loves dogs like Molly. Yay, Molly! What wonderful news! Molly, what big eyes you have. That’s absolutely wonderful news. You can be as naughty as you want today! An extra round of doggy treats in celebration! Congratulations! Woof! A big beagle AROO for you Molly! YEA!! I am so happy for you and your family Molly!! Felicitaciones….. muchos años perrunos por delante. Congrats to Molly!!!! Fabulous and Cancer-Free….. ugh….unleash the tears….. Pink nail polish! May you live a long and incredibly happy life pretty girl. Wonderful news Molly & Family. I am very glad for you. ((( BIG HUGS ))) for Molly and her family!!!!!!!!!!! So happy for Molly and your family. Love that she is all dolled up in front of the fridge. May those long ears blow back in the wind in celebration of a long healthy happy life. Makes me so happy I’m tearing!!!!! Congrats ! Awesome news! So happy for your family! Perfect place for a hound to celebrate, right in front of the frig. Glad she is healthy. Pretty girl and love the nails!